Major progress in the treatment of acute myelogenous leukemia (AML) has occurred during the past decade. Advances in chemotherapy and supportive care have been associated with an increase in the complete remission rate of patients under the age of 60 with AML from 35%–55% [5, 7] to approximately 75% [2, 9, 16]. More importantly, the median duration of complete remission and the percentage of patients in long-term continuous complete remission has steadily improved. This has resulted from postinduction combination chemotherapy [10, 13, 18, 20] or chemoradiotherapy and transplantation of marrow from histocompatible siblings [4, 15, 21]. 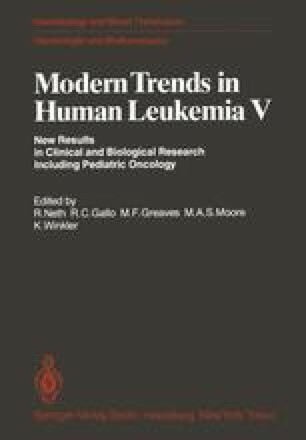 In 1976 the VAPA protocol was initiated to specifically improve the duration of complete remission for children and adults (< 50 years) with AML. In 1980 we reported encouraging results obtained with this approach [12, 22], and this report is an update of the study.